Celebrating its ninth year, Goldenvoice has announced the 2015 Stagecoach Music Festival lineup of artists and country fans will not be disappointed. 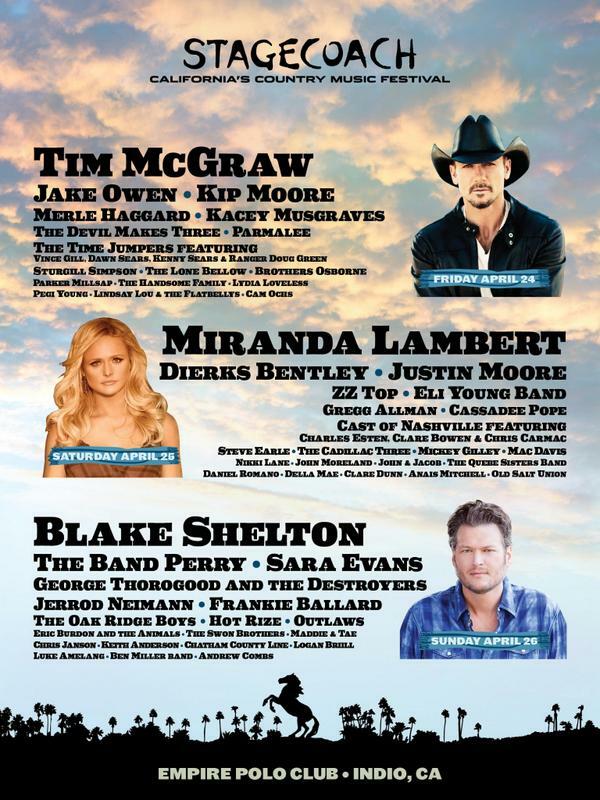 Tim McGraw, Miranda Lambert and Blake Shelton are each headliners for the three-day festival that takes place in Indio, California following Coachella earlier the same month. Jerrod Niemann, Eli Young Band, Kacey Musgraves, Kip Moore, ZZ Top, Merle Haggard, Sturgill Simpson, and many more! Tickets go on sale next Tuesday, Oct. 14th at 10 am PT with three-day passes starting at $269.